Blueberries are acid-loving plants. True. This woody perennial requires sun to partial shade with moist, well-drained acidic soil. Before planting blueberries, you should test the pH to make sure the acidity levels are 4.5 to 5.2. If not, you must condition the soil with an acidifier. New England soils are typically acidic in nature. The soil may not need a lot of work to achieve ideal conditions for growing blueberries. Blueberries should be pruned in May. False. Blueberries should not be pruned until Mid-March after four years of initial growth. Remove the blossoms the first and second years after planting to promote vigorous growth. Unfortunately, you need to forgo the blueberry pancakes and muffins for a couple years before you can reap the benefits. Blueberries have a deep root system. False. Blueberries have a shallow root system and only require that the first 6-12” of soil are prepped. Blueberries need just the right levels of moisture and pH. Although they don’t require lots of space, you do need the proper nutrients and acidity to produce a great crop. The best time to plant blueberry bushes in the Northeast is early spring, after the threat of a hard frost. True. In other parts of the country, it may be best to plant in the fall. However, in the Northeast, planting in the spring allows the plant or shrub an entire growing season to become established prior to its first winter – a repeated lesson in Annie’s blog. Planting more than one variety of blueberries is important for cross pollination. True. Planting multiple varieties can improve cross pollination and extend the fruiting period. Also, certain varieties are more flavorful while others store better so mix it up to get the most value. Blueberries are an excellent choice to consider for several reasons. Primary is its fruit production. 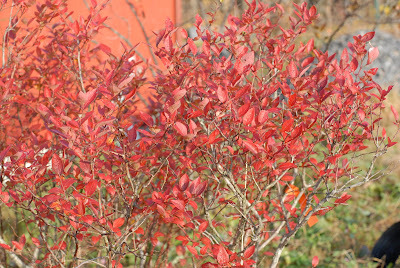 However, with its exceptional ornamental value, fall and winter interest and amazing habitat for birds, this shrub offers a lot for one species. Now is the time to place your bare root stock order for your garden. It is less expensive than buying them in a container. If you order them now, the plants will be shipped in the middle to latter part of April – the ideal time to get them in the ground and start gardening. Countdown to April – it is not that many weeks away.